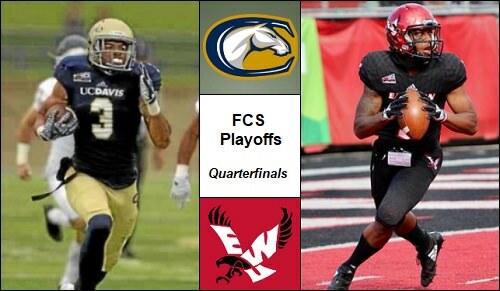 Welcome to SCtoC's coverage of the Eastern Washington Eagles' march through the Football Championship Series playoffs. Each Eagles game will be previewed here with this serving as the game thread. Included will be scoring updates and stat summaries following each quarter, and at the end of the game. What: The Eagles meet a familiar foe as they welcome the Aggies to Cheney. When: Saturday, December 8 at 1 p.m.
2018 Records: Aggies 10-2 (7-1 Big Sky); Eagles 10-2 (7-1 Big Sky). Head Coaches (overall as HC): Aggies - Dan Hawkins (133-70-1); Eagles - Aaron Best (16-6). 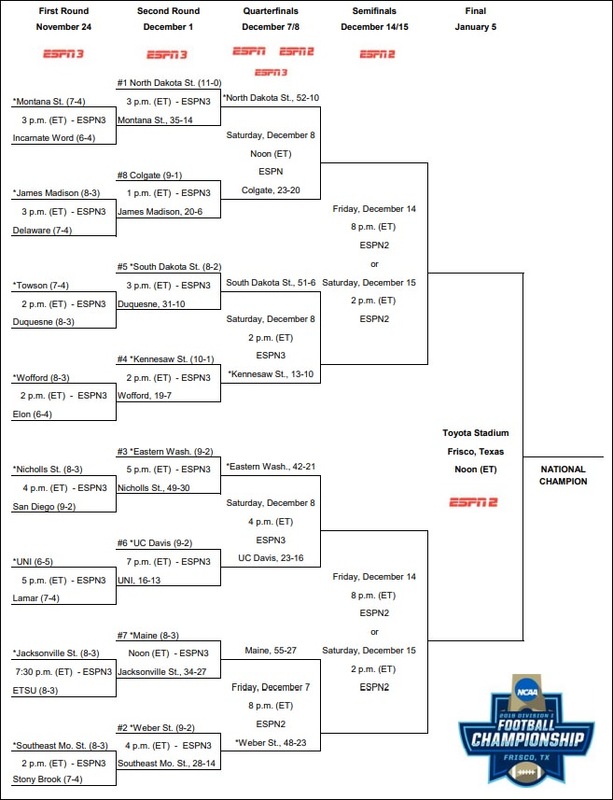 Last Week: The Aggies defeated Northern Iowa, 23-16, in round 2. The Eagles defeated Nicholls, 42-21, in round 2. This season: The Eagles defeated the Aggies, 59-20, at Cheney. Aggies Notes: The Aggies finished the regular season in a three-way tie for the first place in the Big Sky Conference along with the Eagles and Weber St. This will be the second time in four weeks where they will travel to play at Eastern Washington. The Aggies featured a six-game wining streak during the middle of the season, which snapped by their 59-20 loss to the Eagles in week 11. Aggies head coach Dan Hawkins was the head man at Boise St. from 2001-2005, leading the Broncos to four bowl games in those five years. The Aggies jumped out to a 16-6 halftime lead and were able to hold off Northern Iowa in round 2 of the playoffs to advance to the quarterfinals. Jake Maier completed 28 of 42 passes for 310 yards with a touchdown and a pair of picks. Keelan Doss hauled in nine of those passes for 137 yards, and Jared Harrell added six grabs for 79 yards in the win. Tehran Thomas led all rushers with 13 carries for 87 yards. Eagles Notes: The co-Big Sky Conference champion Eagles (they share that honor with the Aggies and Weber St.) looked strong in their opening round playoff win over Nicholls St.; a game in which the Eagles outscored the Colonels in the second half, 32-7 in the second half. The Eagles have not lost a step after losing starting quarterback Gage Gubrud to injury in October. Enter Eric Barriere, who has led his team to wins in their final four games of the regular season, as well as last week's playoff victory. They were afforded a bye in the first round. The Eagles' lone conference loss of the season came at the hands of Weber St. in a 14-6 defensive battle. Barriere was 17 of 29 for 162 with a score and an interception. He also rushed nine times for 54 yards. Running back Sam McPherson has been solid all season, and gained 137 yards on 20 carries with two touchdowns. He also tossed one pass for 32 yards. Andrew Boston caught five balls for 89 yards and a touchdown in the win. Additional Notes: The winner of this game could very well face another Big Sky Conference opponent. Weber St. goes to battle against Maine in the quarterfinals. Should the Wildcats win, they are guaranteed to face one of these teams. Weber St. defeated the Eagles this season, but did not meet the Aggies. The Big Sky has provided three of the top six seeds in the playoffs. Weber St. is ranked second, the Eagles third and the Aggies sixth. Top-ranked North Dakota St., which is leaving the conference to join the Missouri Valley Conference, was not officially a member of the Big Sky, but played a Big Sky schedule this season. Photo Credits: Above left: Aggies WR Keelan Doss courtesy Joel Rosenbaum/The Reporter. Above right: Eagles QB Eric Barriere courtesy McKenzie Ford/The Easterner. Good luck to the Eagles. And, we are under way. Amazing to me how long its been since I've listened to Larry Weir call a game. Touchdown Eastern Washington. Terence Grady 5 yard pass from Eric Barriere. Roldan Alcobendas kick. Nice opening drive for EWU. Interception by the Eagles. They have the ball at the Agies' 22. Score update: Army leads Navy, 7-0, at halftime. Touchdown UC Davis. Ulonzo Gilliam 29 yard run. Max O'Rourke kick. Touchdown UC Davis. Ulonzo Gilliam 24 yard run. Max O'Rourke kick. Touchdown Eastern Washington. Henderson Belk 13 yard pass from Eric Barriere. Roldan Alcobendas kick. It's more.competitive than I thought it might be. Eagles intercept the Aggies and have the ball with 3:39 left in the first half. I agree. It looks like the Eagles may be catching some momentum though.